The Southern Connecticut State University track and field team is well recognized as one of the top programs in NCAA Division II. This past year, the men’s team defended its Northeast 10 indoor track championship and won back-to-back NE 10 titles in outdoor track. 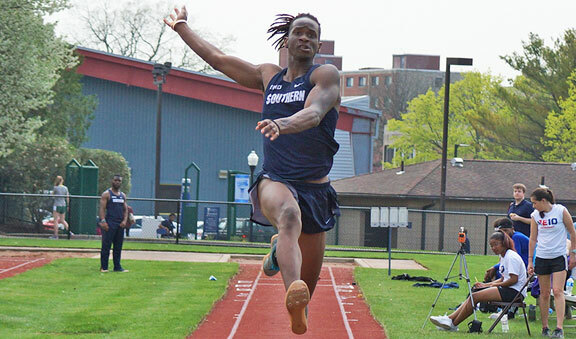 Southern went on to win the New England championship, the program’s fifth title and fourth outdoor championship, and placed 24 athletes on the All-Region team, including former Greyhound Fejiro Onakpoma. Onakpoma, who recently finished his sophomore year at Southern, was at his very best at the NE 10 outdoor championships. Onakpoma landed gold in the triple jump with a leap of 15.44 meters, setting a new conference record in the process, and also finished sixth (6.89) in the long jump. His leap in the triple jump qualified him for the NCAA championships. Onakpoma, who was one of three Owls to compete at the NCAA outdoor championships, placed 18th in the triple jump at the NCAAs with a leap of 14.55 meters. At the New England championships, Onakpoma took seventh (6.68) in the long jump to help the Owls win the title. Onakpoma also had plenty of success during the indoor season. He was named to the All-Region team, and competed at the NCAA championships after finishing second at the NE 10 indoor championships in the triple jump with a leap of 14.58 meters. Onakpoma finished 12th at the NCAA indoor championships. “I became an All-American during the indoor season going to the NCAA championships,” Onakpoma said. “That really pumped me up, looking forward to making it again during the outdoor season. The former Greyhound burst onto the track scene as a senior at Naugatuck, winning the Class L, State Open and New England titles in the triple jump. Deciding to compete at the collegiate level and join Southern seemed like a natural progression, due to a strong Naugy connection with the Owls’ program. Former Greyhound Georgette Nixon, a four-time All-American and 2015 NCAA champion, is an assistant coach at Southern, and former Naugy assistant coach Joe Van Gilder also coaches for the Owls. The Owls have also had their share of former Greyhounds on the roster, including Colin Reilly. In the 2016-17 season, Reilly earned All-New England honors in the distance medley relay and the 4×800 relay during the indoor track season as a senior. Onakpoma said the team is a close-knit group that trains together during the offseason, and the athletes push each other to do their best.